Renewables provided nearly 30 per cent of the electricity generated in the UK in 2017, official figures have revealed, as output jumped by a fifth due to high winds and new capacity. Low-carbon sources accounted for the majority of generation for the first time ever, according to the latest annual Digest of United Kingdom Energy Statistics (DUKES) from the Department for Business, Energy and Industrial Strategy (BEIS). Renewable output rose by 20 per cent year-on-year to 99TWh. Wind power accounted for almost four fifths of the increase, with onshore generation soaring by 39 per cent to 29TWh and offshore generation swelling by 27 per cent to 21TWh. Solar output climbed 11 per cent to 12TWh. This was mainly the result of new installations. Onshore wind capacity grew by 18 per cent to 12.8GW and offshore wind capacity by 32 per cent to 7GW. Solar capacity was up 7 per cent at 12.8GW. Renewables’ share of the generation mix increased by 4.8 percentage points to a new record high of 29.3 per cent. Wind’s share rose by 3.8 percentage points to 14.8 per cent, of which 8.6 per cent came from onshore generation and 6.2 per cent from offshore generation. Solar provided 3.4 per cent. 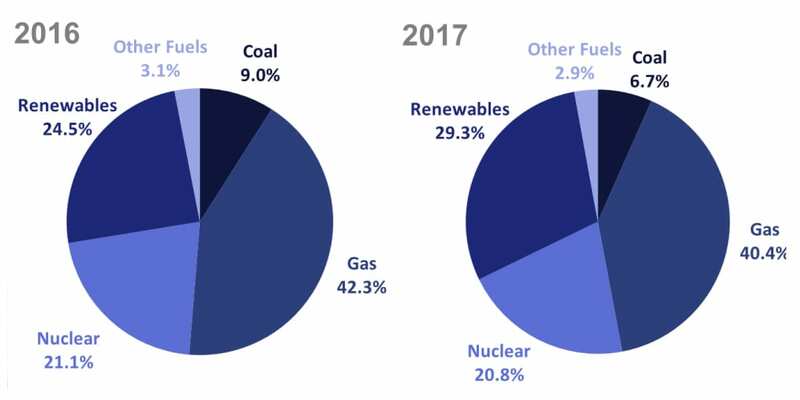 Despite a 2 per cent fall in nuclear output to 70TWh, generation from all low-carbon sources rose by 4.5 percentage points to 50.1 per cent. Coal output fell by 27 per cent to 23TWh, lowering its share of output by 2.3 percentage points to 6.7 per cent. Gas generation was down 5 per cent at 137TWh as its share of the total fell by 1.9 percentage points to 40.4 per cent. The carbon intensity of the power grid dropped 15 per cent to 225gCO2/KWh. The figure was down 54 per cent on the 2012 level of 483gCO2/KWh. There was a 1 per cent fall in the total volume of electricity supplied to UK consumers to 353TWh. Around 96 per cent came from domestic generation which remained broadly flat at 336TWh. The total capacity of all UK generators increased by 4 per cent to 81.3GW. 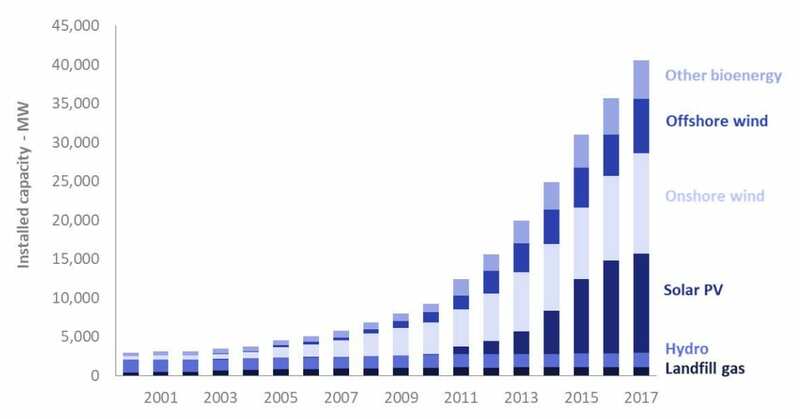 “[These] record figures demonstrate how fast renewable energy is transforming the way we generate power to create an energy system fit for the future,” said Renewable UK executive director Emma Pinchbeck. She continued: “It’s great to see that the UK’s cheapest power source, onshore wind, is making such a significant contribution to the nation’s power needs. So it’s baffling that government is still excluding new onshore wind projects from the market place. “Opinion polls show that two-thirds of people think ministers should change their current policy and allow onshore wind to go ahead where it has local support, and most Conservative voters agree with them”. Energy UK chief executive Lawrence Slade, said: “Such extraordinary progress in such a short space of time shows what can be done with a clear policy direction and the right framework to encourage investment and innovation. “We welcome recent announcements from the government on future contracts for difference auctions and the Crown Estate on potentially expanding offshore wind sites. The effects of the withdrawal of government support for onshore wind were evident in a new report from Wind Europe published this week, which showed 4.5GW of new wind capacity was installed across the continent over the first half of 2018. The UK once again dominated the offshore arena, accounting for around 0.9GW of the roughly 1.1GW which was installed across the continent. However, a meagre 13MW of onshore wind capacity was built in Britain during the period. Germany, by comparison, built more than 1.6GW of onshore wind capacity, putting it in first place overall and for onshore wind installations specifically.